The smartphone market saw an interesting dichotomy this week that reflects a changing basis of competition. Samsung announced a revenue and profit decline, while Xiaomi's Q3 sales grew 20% sequentially (and 300% annually). For Xiaomi, this continues a pattern that I highlighted earlier this year. Lack of cyclicality is usually driven by a couple of factors -- (1) A rapidly growing market, (2) Product and business model superiority relative to the basis of competition prevalent in the market, and (3) Expanding geographical reach. It seems that rapid sequential sales growth with minimal cyclicality seems to be a good indicator of future performance. At this point, it has become exceedingly clear that Xiaomi's primary business model is aligned with the basis of competition prevalent in the market, and Samsung's is not. Xiaomi's report also makes their 60 million sales target for the year look downright conservative as their cumulative sales have already hit 44 million (upto Q3 2014). 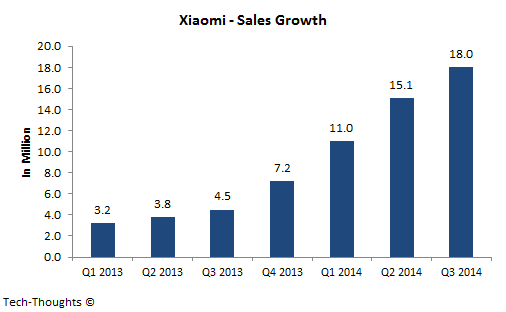 In order to match 60 million, Xiaomi's Q4 sales would actually have to decline, sequentially, to 16 million. 20-22 million seems to be a more likely range, which would put their annual sales at the ~65 million mark. Most importantly, this could push their user base above the 100 million mark. Not bad for a company that hangs their hat on monetizing services.